Users of the popular Blackberry Twitter app UberTwitter found themselves locked out this weekend when the famously open social network decided to crack down. Twitter has claimed that UberTwitter was in breach of policies and trademarks. Specifically they cited the use of the tweet-elongation service tmi.me which allows people to post more than 140 characters, and significantly the use of the name UberTwitter. The service has now been changed to UberSocial with immediate effect. Tweetdeck which recently introduced Deck.ly to allow longer tweets must be watching with interest and concern. DestroyTwitter is also presumably on the radar. 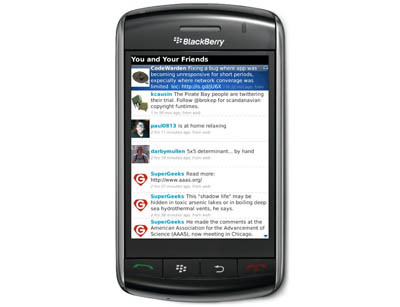 Apart from the obvious inconvenience to users of the service Twitter has raised the suspicions of commentators by turning off the Blackberry application without notice and promoting their own Twitter for Blackberry service at the same time. UberTwitter is owned by UberMedia which was recently bought by Bill Gross, who has raised $17.5m to build the Twitter platform. Gross played a key role in building Google’s revenue mode and he’s applying a similar strategy with UberMedia and applying that to Twitter. Potentially he has a better way to make money out of Twitter than Twitter does and this is bound to cause concern for the micro-blogging service. At the time of writing Twitter has not responded to the speedy changes and UberSocial remains unapproved ad offline.